Hal Scardino wears black low cut Converse “Chuck Taylor” All Stars in the film. Omri keeps his living toys in his dresser drawer. 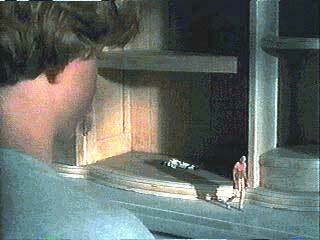 The Indian in the Cupboard is a family-oriented film that gives you two interesting premises: The first is how will a mild-mannered nine year old boy respond to a situation where he suddenly has god-like control over little plastic figures that have come to life in his room? This is a new twist on the basic fantasy behind all dolls and action figures that children play with. The second premise, which is reminiscent of E.T., another of screenwriter Melissa Mathison’s films, asks how will the boy deal with this fantastic turn of events in relation to his family, friends, and the outside world? The boy’s name is Omri (Hal Scardino), and he lives in a Manhattan townhouse with his older brothers and parents. For a birthday present, he’s given an old wooden cupboard. 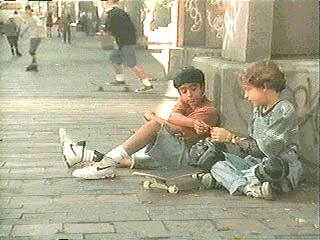 Later, his friend Patrick (Rishi Bhat) gives him a small plastic Indian figure. His mother Jane (Lindsay Crouse) finds a key that fits the cupboard door. He puts the Indian in the cupboard, locks the door, and goes to bed. In the morning he awakes to hear banging noises from inside the cupboard. He opens ithe cupboard and is amazed to find that the plastic figure has come alive — a four inch, frightened Onondaga warrior named Little Bear (Litefoot), who has been transported from the eighteenth century into Omri’s bedroom. When Little Bear first sees Omri, he thinks that he is the Great Spirit and his reaction is one of fear and awe. Omri is thrilled and excited to have somehow created a living play thing that is so real,. Later, Omri repeats the process with another figure, and soon Little Bear is joined by a miniature cowboy from the nineteenth century American west named Boone (David Keith). Little Bear walks out of the cabinet a live miniature being. Now that this miracle has happened, Omri slowly begins to realize the heavy responsibility that he bears for having created living beings out of his plastic figures. Little Bear soon figures out that Omri is just a boy, and not the Great Spirit, and he warns Omri not to use “magic that you do not understand.” As the two develop a friendship, Little Bear tells him about his life as an Indian, his values, and his family. While dealing with these new people in his life is initially beyond Omri’s understanding, he knows that he must try to go about his daily life normally, without revealing the awesome secret he has stumbled on. Another interesting feature of this part of the story is the replay of the hostility between cowboys and Indians, on one level a typical kid’s game, but here played out with some reality by Boone and Little Bear. In a very revealing scene, they are watching a western on television and Little Bear is so enraged by the slaughter of Apaches during the story that he shoots an arrow at Boone, almost killing him. To help Boone recover, Omri uses the cupboard to creates a medic, Tommy (Steve Coogan), from a World War I toy soldier. But soon the outside world begins to intervene. Omri can’t resist telling his best friend Patrick about the figures, but Patrick doesn’t show any of the same restraint that Omri has exercised; he wants to play with Boone and Little Bear like toys and show them off to the other students at school. As the story line progresses, Omri must deal with both the scrutiny of the outside world and the demands of his miniature friends. Patrick and Omri exchanging cards on the street. Check out the skateboarder, also. 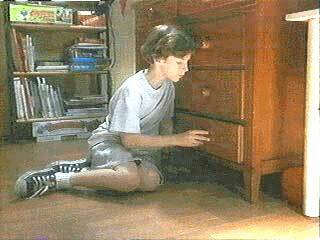 The most unuusal feature about The Indian in the Cupboard is the low-keyed manner in which everything is presented. When Omri first discovers Little Bear, the scene is set as a quiet magical moment, not the frenzied response you might see from a typical non-thinking kid. When Little Bear, Boone, and Tommy become aware of their situation, you would think that they would also be very upset, scared, and frustrated, but instead we hear Omri tell them that they should think of this experience as part of a dream. There are plot twists where you would expect some sort of violence or action in the typical Hollywood film, like when the magic key is lost, and Lite Bear goes under the floorboards to find it. Jane, Omri’s mom has just warned him that there is a dangerous rat loose under the floorboards, so you assume that some sort of fight is about to start but it never happens. Instead, director Frank Oz keeps this film more of a character study, emphasizing relationships rather than special effects and action. While some may think this makes the film too slow paced, there is a calm and pleasant simplicity about it that is refreshing. After all, not every kid is the typical wise-cracking, all-knowing mini-adult that we normally get in modern family-oriented movies. There are a lot of nine year olds like Omri -- sincere, polite, and very much involved in their own personal worlds of imagination. This gives the film a touch of realism that helps you to more easily accept the improbable plot because you are focusing on issues like friendship, bridging cultural differences, and ethical behavior. Patrick and Omri’s teacher has to intervene when the two argue about whether to tell others about the miniature people. 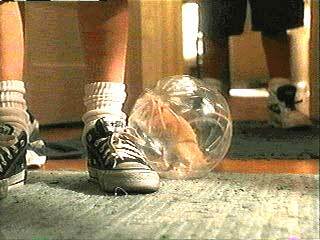 The rat is placed in a plastic ball so it won’t be able to attack Little Bear and Boone. Omri, played with soft-spoken enthusiasm by Hal Scardino, wears low cut black chucks throughout the film. There are several closeups of them during the film, as shots of his chucks catch your eye when the cinemaphotography is used to compare normal sized objects with the miniature figures. These closeups also give you an idea of how things look from Lite Foot’s and Boone’s perspective. 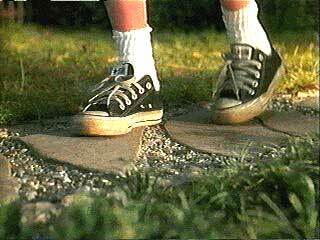 These are the best chucks moments in the film. Omri searches for Lite Foot in his back yard. The Indian in the Cupboard. (1995) Hal Scardino, Litefoot, Lindsay Crouse, Richard Jenkins, Rishi Bhat, David Keith, Steve Coogan. Directed by Frank Oz. Categories: Drama, Science Fiction/Fantasy, Family, Coming of Age.